David Christian Hoffman was born on 22 March 1946 in Buffalo, Erie County, New York. David Christian Hoffman died on 29 May 1999 at age 53 in Naples, Collier County, Florida, at Naples Community Hospital. The following appeared on 6 June 1999 in The Buffalo News: David Christian Hoffman, 53, a real estate agent in Naples, Fla., died May 29, 1999, in Naples Community Hospital, after a long illness. A Buffalo native, Hoffman was a graduate of Sweet Home High School and Cortland State College. For several years, he taught history at a high school in Binghamton. He later moved to Denver and worked in restaurant management. Hoffman also worked as a financial consultant and business manager in Atlanta and then went into real estate in Dallas before moving to Naples, Fla., where he was a member of the Naples Area Board of Realtors. In Naples, he also handled publicity for a homeless shelter. He also was an avid sportsman. Survivors include his wife, Katherine; a stepdaughter, Laurie Smith of Dallas; and two sisters, Judith A. of Buffalo and Joan L. Worthington of St. Catharines, Ont. Funeral services were held Tuesday in Naples. The following appeared on 12 June 1999 in the Rocky Mountain News: David Christian Hoffman, 53, of Naples, Fla., formerly of Denver, died May 29 in Florida. Mr. Hoffman was born in Buffalo, N.Y., on March 22, 1946. He married Katherine Hoffman. He worked in restaurant management in Denver. He was a Realtor in Texas and Florida. He was a member of the Naples Area Board of Realtors. He was involved in fund raising for the Grace Coalition and Assembly Center and Shelter for the Homeless. Survivors include his wife; stepdaughter Laurie Smith of Texas; sisters Joan Worthington of Canada, Judith Hoffman of New York. 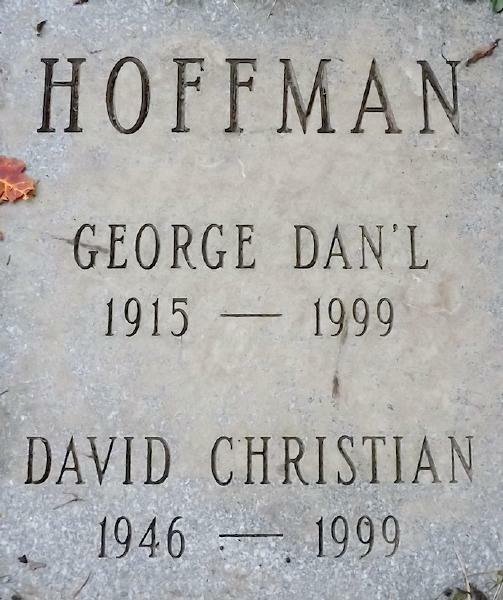 A single grave marker identifies the graves of George Daniel Hoffman and David Christian Hoffman.